Golden Balls, hosted by Jasper Carrot, is based on a version of the Prisoner’s Dilemma. For added interest, try and predict what the 2 contestants are going to do. Any psychological cues to pick up on? Game theory is an interesting branch of mathematics with links across a large number of disciplines – from politics to economics to biology and psychology. The most well known example is that of the Prisoner’s Dilemma. (Illustrated below). Two prisoners are taken into custody and held in separate rooms. During interrogation they are told that if they testify to everything (ie betray their partner) then they will go free and their partner will get 10 years. However, if they both testify they will both get 5 years, and if they both remain silent then they will both get 6 months in jail. So, what is the optimum strategy for prisoner A? In this version he should testify – because whichever strategy his partner chooses this gives prisoner A the best possible outcome. Looking at it in reverse, if prisoner B testifies, then prisoner A would have been best testifying (gets 5 years rather than 10). 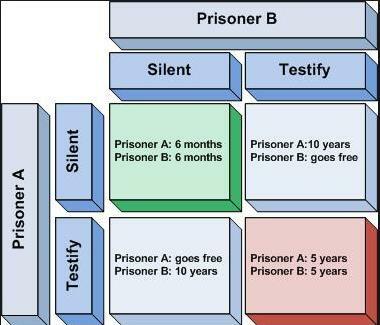 If prisoner B remains silent, then prisoner A would have been best testifying (goes free rather than 6 months). This brings in an interesting moral dilemma – ie. even if the prisoner and his partner are innocent they are is placed in a situation where it is in his best interest to testify against their partner – thus increasing the likelihood of an innocent man being sent to jail. This situation represents a form of plea bargaining – which is more common in America than Europe. Part of the dilemma arises because if both men know that the optimum strategy is to testify, then they both end up with lengthy 5 year jail sentences. If only they can trust each other to be altruistic rather than selfish – and both remain silent, then they get away with only 6 months each. So does mathematics provide an amoral framework? i.e. in this case mathematically optimum strategies are not “nice,” but selfish. Game theory became quite popular during the Cold War, as the matrix above represented the state of the nuclear stand-off. The threat of Mutually Assured Destruction (MAD) meant that neither the Americans or the Russians had any incentive to strike, because that would inevitably lead to a retaliatory strike – with catastrophic consequences. 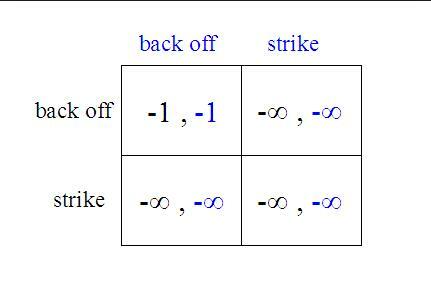 The above matrix uses negative infinity to represent the worst possible outcome, whilst both sides not striking leads to a positive pay off. Such a game has a very strong Nash Equilibrium – ie. there is no incentive to deviate from the non strike policy. Could the optimal maths strategy here be said to be responsible for saving the world? 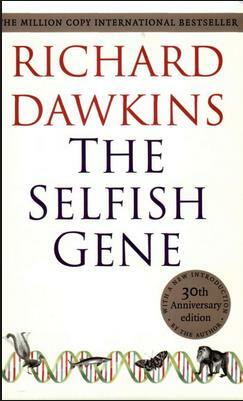 Game theory can be extended to evolutionary biology – and is covered in Richard Dawkin’s The Selfish Gene in some detail. Basically whilst it is an optimum strategy to be selfish in a single round of the prisoner’s dilemma, any iterated games (ie repeated a number of times) actually tend towards a co-operative strategy. If someone is nasty to you on round one (ie by testifying) then you can punish them the next time. So with the threat of punishment, a mutually co-operative strategy is superior. You can actually play the iterated Prisoner Dilemma game as an applet on the website Game Theory. Alternatively pairs within a class can play against each other. An interesting extension is this applet, also on Game Theory, which models the evolution of 2 populations – residents and invaders. You can set different responses – and then see what happens to the respective populations. This is a good reflection of interactions in real life – where species can choose to live co-cooperatively, or to fight for the same resources. The first stop for anyone interested in more information about Game Theory should be the Maths Illuminated website – which has an entire teacher unit on the subject – complete with different sections,a video and pdf documents. There’s also a great article on Plus Maths – Does it Pay to be Nice? all about this topic. There are a lot of different games which can be modeled using game theory – and many are listed here . These include the Stag Hunt, Hawk/ Dove and the Peace War game. Some of these have direct applicability to population dynamics, and to the geo-politics of war versus peace. « Is God a Mathematician?